‘Smudging’ is the common name given to the Sacred Smoke Bowl Blessing, a powerful cleansing technique from the Native American tradition. California White Sage removes negative energy. 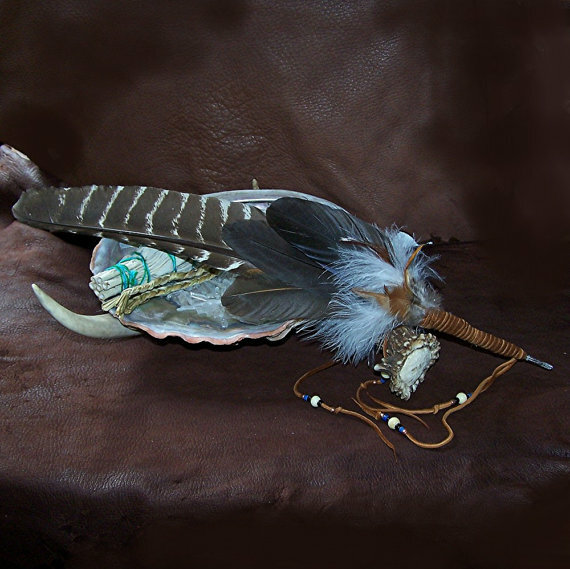 You may use a smudge stick or single piece of Sage and a large feather to waft the smoking sage into the auric field and space you inhabit. Incense can be used by burning a piece of charcoal and placing the herbs/ resin on top. There are many different kinds of incense but Copal is probably one of the best for cleansing. Once lit allow the charcoal disc to turn white before placing the incense on top. Use a feather to waft the energies into the auric field and personal space. Please Remember to Place Charcoal & Copal in a Fire-Proof Container! Crystals can help protect and cleanse your energy. Quartz Crystal may be used for cleansing and Amethyst is also a great cleanser if you work on a computer. Place a cluster on or near the computer to neutralize the electromagnetic energy it transmits, you can also use plants to soak up the vibrations. Please Remember to Cleanse the Crystals After Use with Sage! Sound is an effective cleanser. Clapping your hands, using bells, chimes, crystal bowls, music, singing, anything that has a vibrational energy can change stagnant energy. Water helps wash away dirt, both physically and energetically. Adding Epsom Salt to a bath stimulates the flow of your own energy and also draws minor psychic debris out of the Energetic Field. Note: Certain oils should not be used during pregnancy; chamomile, geranium, jasmine, lavender, neroli, patchouli, sandalwood, ylang ylang.